Dropping onto my poles from the exertion, I heard back “You can make it! Lock your [legs] out, stay under [lactic] threshold.” The words obscured in the wind and I breathed heavily as they sunk in. I removed my goggles now, unable to see through them any longer. I could not go on. I knew the way back, I was sure of my physical aptitude and they could catch me on the way down. My legs did not work… “Just a quarter mile left.” My head was pounding but I rationalized those words. This is what I came for, not a foreseeable victory, but for the uncertain opportunity to reach something beyond. I was at the mercy of the mountain, and I refused to submit. 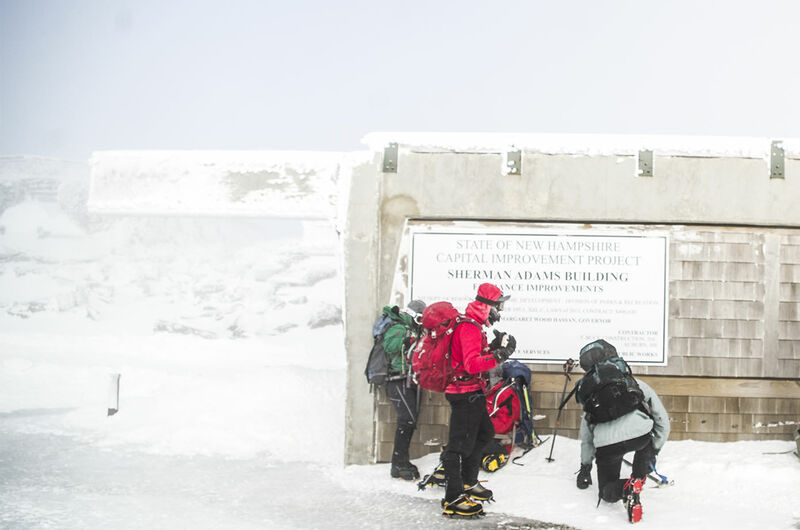 The six of us had gathered at 3:00am waking as early as midnight to start our ascent of the “Home of the World’s Worst Weather.” We were at the base of Mount Washington in New Hampshire chasing the sun for a sunrise summit. The forecast predicted conditions that made the mountain famous and we were all eager to face challenges that continued to multiply in the days leading up to this moment. 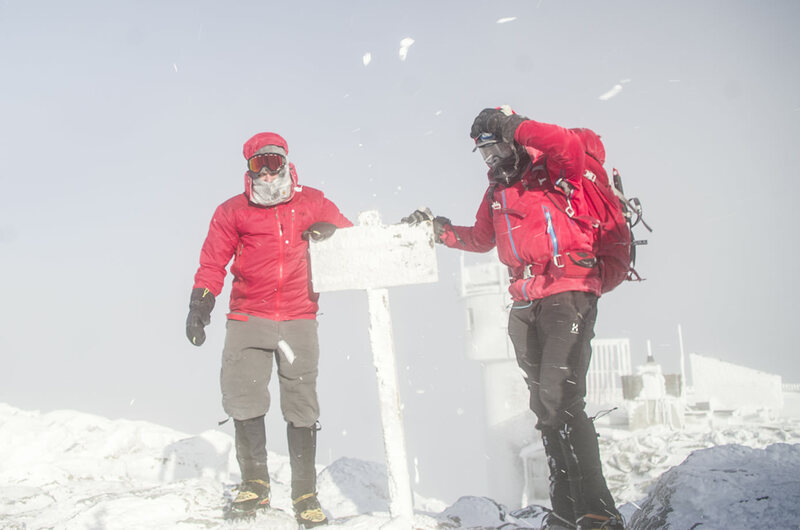 For some of us, this was the fourth year of an annual winter summit tradition and for others the first time climbing the mountain altogether. For me, this was a foray into documenting a truly challenging experience in hazardous conditions. In the comfort of the heated basement of Pinkham Notch, Beau appeared uncharacteristically stiff during our meet and greet. 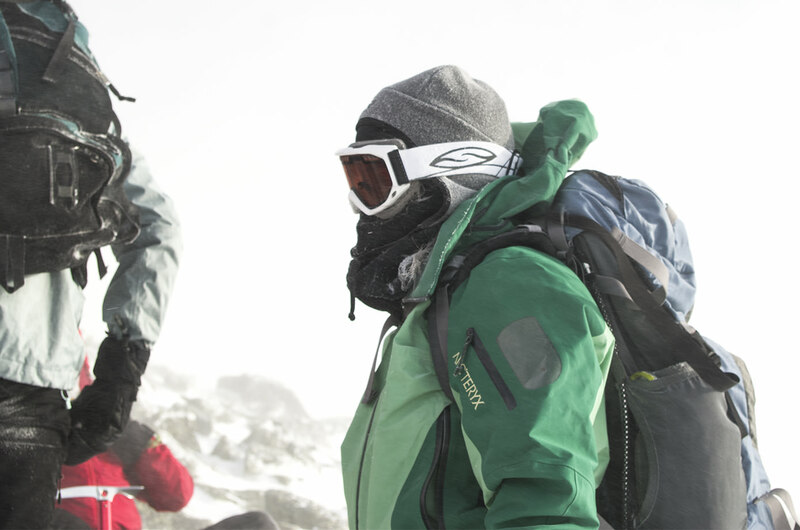 He is a veteran to the mountain and seasoned climber who just returned from the most challenging season on Mt. McKinley on record. Today he was alert, even absentminded, checking conditions constantly until the last minute before we exited through the door. This was a sign and should have tipped me off to what we were about to encounter. But, along with everyone else, I was too excited to notice. Geared up, we gravitated towards a glass door so dark it seemed to be sucking light in, along with the heat from our bodies. The world outside was silent and windless with a gleaming moon and speckled stars on an otherwise clear sky. 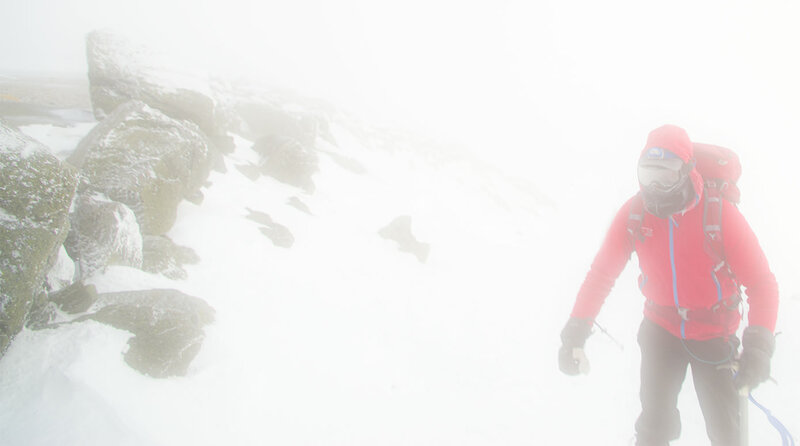 It was peaceful and beautiful, leading one to believe perfectly safe conditions stretched all the way up to the summit. This was a pleasant fiction, however, as the clear sky actually meant there was no blanket of clouds to insulate the ground and any heat had long evaporated into space, surrounding us with air that was piercingly sharp. Experience was probably the only thing our group was not abundant in, as I would come to learn that we are all strong athletes. There was Kyle, a tall, clean-cut businessman and competitive bicyclist with a determined expression who didn’t waste time with words. Kellie and Paul were a couple matched in personality and athletic prowess — she a professional athletic trainer with boundless energy, endurance, and a wide and pleasant smile; he a lean, MMA-trained UFC fighter with a wild beard. Adam arrived last, tall and fast-moving with an aloofness that didn’t disguise his dedication and experience. He’d already climbed Washington once this season. And finally, Beau was the organizer and leader for the day, a proverbial mountain man (despite his clean-shaven face). 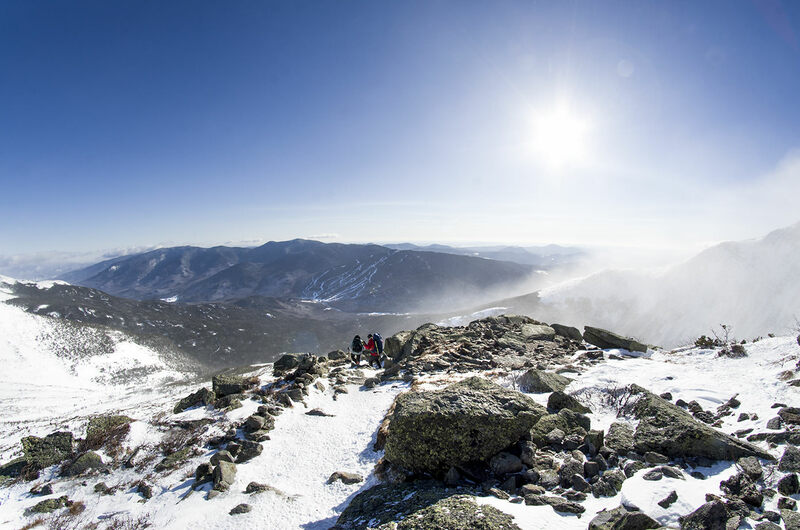 Beau was a minimalist comfortable in wild terrain like this — he once climbed Mount Washington in his bare feet. The first couple of miles were beautifully silent as the snow reflected moonlight and seemed to illuminate our path. 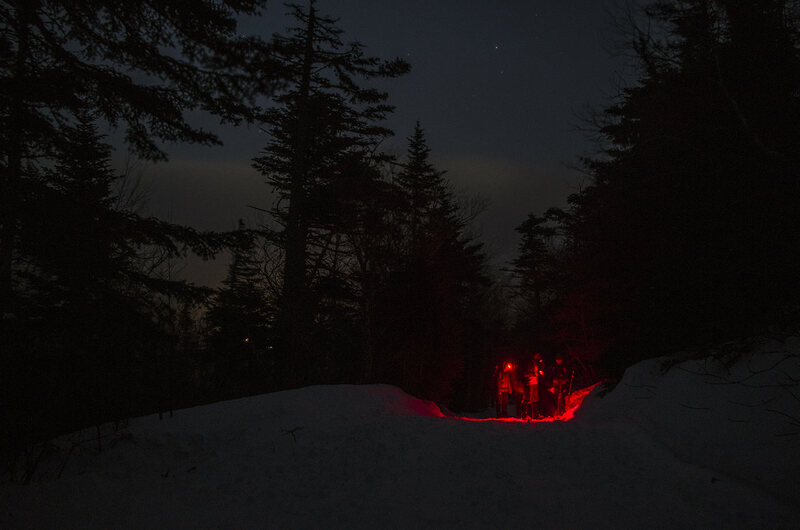 We left our headlamps off, letting our eyes adjust as the light of the lodge disappeared behind us. This first part of the trail is a gradual inclined highway wide enough to walk three abreast, a gentle slope that can lull you into a false sense of security. Instantly, like a startled school of fish, the group shifted all at once and headlamps popped on scanning the area. Paul was suddenly two feet shorter and wriggling upwards. He had punched through the snow path we were walking on. Where he pulled his leg out, there was a hole straight through to a hollow. It ran under the snow the full width of the trail, carved by an unknown stream glimmering some feet down. Luckily, he was unhurt, but the group became alert and the headlamps cautiously extinguished. As we resumed, I turned to continue a conversation I was having with Kyle but he responded to a completely unrelated topic. Did I hit my head? The darkness is confusing. With headlamps on, it feels as if an endless treadmill tunnel is enveloping you. With headlamps off, the world is dark shapes against white snow shifting to a rhythm of crunching steps. It is easy to fall into a trance and a startling event can stun you. For a moment, my mind raced to make sense until it clicked that I had simply continued the conversation I was having, but was now speaking to someone else. I was now talking to Paul, he had a surprisingly upbeat tone despite his fall and ended each sentence with a laugh. Then again, he was trained to respond to assaults like the one by the hole that just tackled his leg. I wondered if I would have suffered a worse fate had it been me. After about an hour, Beau signaled us to stop and gestured towards footprints in the forest that none of us would have noticed; we were at the entrance of the Winter Route. Finished with the “easy” part of our hike, what lay ahead was a steep scramble that wound its way through dense trees and over precipitous cliffs. 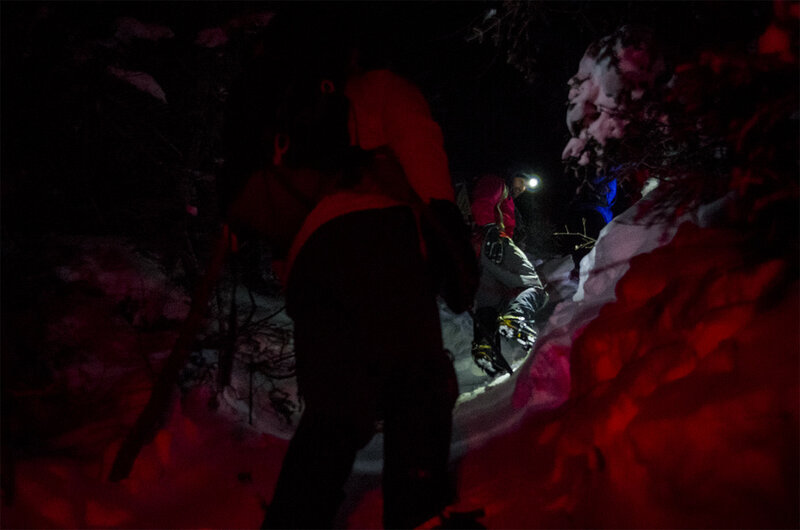 Lights and crampons on, our group stretched into a wriggling multicolored snake crawling up the dark forested slope. Perhaps overestimating our abilities, or just thoughtlessly, we attempted to continue at our previous pace. The trail was unforgiving, however, and our ascent quickly degraded into jerky intervals as we each caught up to the person in front of us and paused to catch our breath. “I don’t remember it being this scary,” gasped Kellie as she flashed a smile. Suddenly, I became aware of a presence in the darkness. Like a strange force, the entire volume of air around me began to move all at once in a great current. The trees had thinned and, as they gave up our shelter, we knew we were entering the alpine tundra. Here, at one last cluster of trees, we took a welcome break. It was evident how challenging the last stretch was as everyone immediately found a seat. This was true for me especially, as I had been alternating between taking photos and sprinting to catch up. Out of breath, and feeling my pack seemingly take on weight, I thought of the first thing I could jettison and pulled out my tea. Sharing the hot beverage would have been more welcome had we not all been hot from the push, and I ended up dumping all but a sip for later. Beau repeated these instructions clearly as we packed on all the layers we brought. The wind blew snow across our vision now and the stars and moon dissolved behind a thickening blanket of speeding cloud. As if sensing our presence, Mount Washington turned on. Tension spread through the group and, as if stepping through a portal, I filed behind Adam out of the shelter of the trees and directly into a churning storm of violence. The raw power of the mountain revealed itself. Temperature dropped as fast as the wind increased and cold flashed through my clothes. I literally felt the blood drain from my hands and feet as it rushed to warm my core; a self-defense mechanism of the body that saves critical organs by sacrificing parts like fingers, toes, noses, and ears. Instantly, my hands stung with cold pain and I struggled to pull my fingers into fists inside my gloves while my hiking poles whipped around in the increasing wind. Like a curtain being pulled over us, snow fell and shape-shifted Adam into a glowing orb of white spinning particles some distance in front of me. Consequently, my headlamp became useless as it illuminated large flakes just in front of my face and obscured my vision. I decided to keep it on if only to serve as a beacon for the others, and turned the beam upward as high as it would go. The trail began to wind around and over large rocks and I started to lose sight of Adam. Breathing in the cold stinging air, I just tried to focus on keeping an even pace. Suddenly, a million things were going wrong. My hands and feet were painfully cold and the soles of my boots felt like a frozen concrete floor. Each step added pain one ounce at a time at specific points of contact. Yet my head was burning up, it was wrapped in too many layers and steaming with sweat. And the sweat, it was causing fog to build up on the inside of my goggles and I was losing my vision. Cold, hot, and blind, and with the group teetering on the brink of my horizon, I could not make any adjustments. So, I charged on. I felt like the rope in a great tug of war. 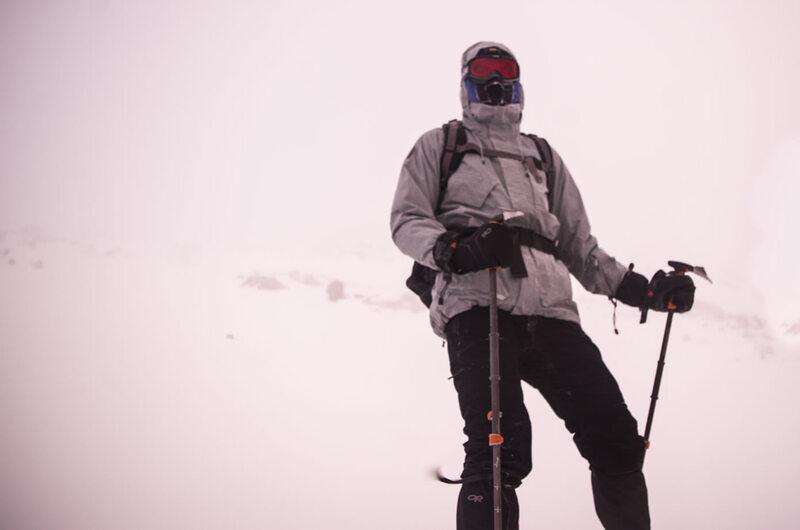 The wind was blasting in bursts of over 50 miles per hour and forcing me to brace against it, then it would let up completely and I would lose my balance. At one point I actually fell to my knees and almost tumbled backwards. My posture became hunched over, boxed out for stability, with my head down and shoulders drooping to try to become more aerodynamic. Every part of me was working. I now came upon the group huddled on the trail. They were weaving in unison like blades of grass in the wind. Beau peeled off and yelled over the gusting air. He asked how I was doing and I honestly replied, “I’m slow!” He then told me that they were waiting to make sure I was okay and that we were to go immediately to a feature called Lions Head. I told him I needed a break, but he told me the others were cold and we had to move. I was dragging behind and resting exposed like this was not an option. At that moment, I felt I was reaching the limits of my physical abilities — and in a truly hazardous environment. Realizing the severity of the situation, I set my goal only on Lions Head. My energy was drained and whether or not I had enough strength to get to the summit suddenly didn’t matter. I knew that the safety of this upcoming resting spot was paramount because there was no other option. Using what I believe was sheer willpower, I pressed on and watched as the others disappeared in front of me. That was okay, I knew where I was, I’d been here before and I knew it was just ahead over a steep climb. In an exhaustive burst of energy, I climbed over the edge and the wind cut out almost completely. The group was scattered, resting, and silent. 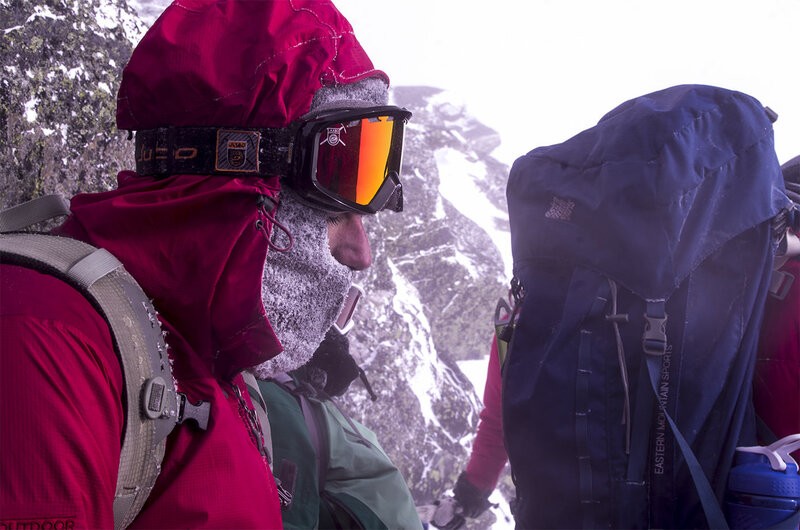 Without hesitation, I dropped down and leaned back, releasing the weight of my pack. Like coiled snakes, my shoulder muscles swelled in relief and I felt an immediate sense of hunger. I ripped open the trail bars stowed in my pocket and Beau explained our situation: we were on the last leg of the hike and the next area would be windy but flat, with one big push after that. Encouraging words to hear, but my mind was racing with concerns and self-assessment. “I don’t know if I am going to make it.” I said to Beau, loud enough for anyone listening in to hear. This was not the place for ego, and being vocal about concerns was a responsible risk management technique, even if it sounded like complaining. It looked like it was trying to hide, a blushing pink that spread across the atmosphere and painted us, too. Then, as if embarrassed at being caught, it dissolved back into the soft clouds. The wind assaulted us and the snow under our feet thinned, revealing bare granite boulders. We were in a vicious wind tunnel, fully exposed on a flat sheer plane identical in every direction. Any exposed skin immediately stung like hot metal searing against it and everything froze. Our goggles were no longer useful because any condensation on the inside of the lens had now literally frozen into a layer of ice. I was peering through a quarter coin sized hole just around my nose, and the only thing that mattered was the shape growing smaller in front of me. Whipped by the wind, we looked drunk. Fatigue set in and each individual was turning their attention inwards. Adam had given up on his goggles, his best attempts at clearing ice became vocal and then stopped. In a bold move, he had accepted the risk and now peered through his hat’s frozen hole which hung around his red nose like a crystal wreath. Kellie was dancing with the wind, and it was taking the lead as she fought to keep up. Paul was hunched towards the ground like me; so silent you would barely know that he was there. And in the front, Kyle caught up and was on Beau’s heels, seemingly mimicking him, while Beau was pulling the whole line. It was as if Beau was tethered by an elastic rope that would snap him to a stop and turn him around, then he would get going again tracking the trail. The mountain grew out of the clouds like a waking giant rising from slumber. Its slope rose upwards and the granite boulders plunged under snow cover that stretched across the surface like elastic skin. We were punching steps in this smooth white surface now, leaving the only visible disturbance in an otherwise indistinguishable world. The only direction that made sense was up and we began to zigzag, digging our boots in sideways to alleviate battered toes that burst with pain at the slightest impact. Dropping onto my poles from the exertion, I heard back “You can make it! Lock your [legs] out, stay under [lactic] threshold.” The words obscured in the wind and I breathed heavily as they sunk in. I removed my goggles now, unable to see through them any longer. I could not go on. I knew the way back, I was sure of my physical aptitude and they could catch me on the way down. My legs did not work… “Just a quarter mile left!” a voice yelled. My head was pounding but I rationalized those words. This is what I came for, not a foreseeable victory, but for the uncertain opportunity to reach something beyond. I was at the mercy of the mountain, and I refused to submit. My muscles felt stiff and unresponsive, but with great effort I used my upper body to lift up and toss my hip forward to pull up my leg and free the crampon from the snow. Although maybe only a couple inches of progress, it was progress nonetheless. I did that again on the other side, and again, until I had a cumbersome rhythm. I waddled with feet open, upwards straight at Paul whose gaze was focused like a flashlight on the snow just in front of him. We all continued in this fashion, perhaps not even moving at all but just pacing in two lines one above the other on a slope somewhere on the mountain. and I didn’t feel helpless. As if I passed some sort of threshold, everything was brighter for some reason. I wondered if it was the remnants of food releasing energy finally, or the pace I fell into, but my mind cleared. I felt alert. With no physical strength but seemingly mentally willing it, I pushed myself up to address an alarming issue; my feet were numb. I leaned against a face of rock away from everyone, and began swinging my legs. Without a source of heat like artificial hand-warmers, and with blood withdrawn into my torso, my feet were trapped in an icy boot. However, I learned a trick from an old friend who spent a lot of time on the ice; to swing my legs in wide swooping kicks. Pulled out by centripetal force, I was driving warm blood to collect at my foot, and it was working. But time was running out as Beau came to ask about my sanity with regard to my gymnastics routine. “Just one minute,” I told him, pain grinding in my hips from the forced motion. “30 seconds,” he responded, “people are getting cold and we have to get moving.” He only gave me 15 seconds. Crawling out the cleaved stone gate we faced the last stretch, a frozen wall of stacked boulders reaching vertically into the sky. 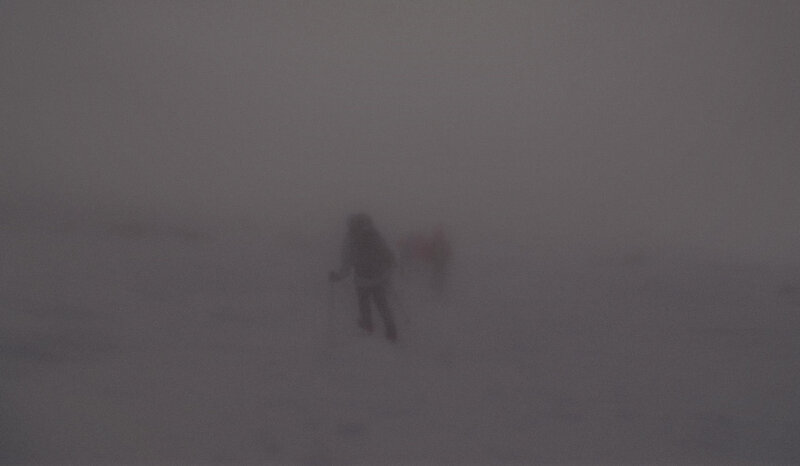 The summit was palpable; although we could not see it, we felt its presence. There was no order among the group now and we filtered between the stones, each choosing our own line. Every rock seemed its own mountain and required deliberate strategy to get around. There was no energy left, in any other situation any rational person in the state we were in would stop what they were doing. It seemed at this moment we were all moving solely on willpower, refusing to allow something just out of our grasp to escape after paying an effort so far beyond expectation. We had passed the event horizon and the mountain bellowed full force. A visible straight line cut across our vision where the rocks ended, and just above, like a perpetual explosion, wind furiously flung out cloud at immense speeds. I stood for a moment and watched as the others reached this precipice and disappeared over it. It was incredible, like a geyser that was the source of all the world’s sky. And when the moment ended, I too crawled over right into the full gale of air. Each step carried with it the weight of the thousands that preceded it. Suddenly, a 90 mile per hour gust of wind stuck me from the front and I dropped forward to brace against my hiking poles. As I strained to lift my neck, my eyes just caught the green shape in front of me stumble from the blow of air, and topple over. It was Kellie, her arms waving around for a hold to grasp onto as she rotated out of control across a glistening surface of polished ice. I moved toward her, but was pinned by another gust and my head dropped. We were all caught in an eddying river of air that reached speeds in excess of 90 miles per hour. The Mount Washington observatory stood around us, built from stone and metal and literally chained to the surface of the summit. Air flowed over and around in visible currents and the only shelter was a concrete wall off to the side, frosted at the edges with compacted ice. The wind gusted in explosive bursts and sent Kellie in a dangerous trajectory towards the edge. As she slid, she was able to get her hands under her, but when she pushed up onto her knees the wind punched her again fiercely. She reeled from the blow, her arms waving in the air, and fell backwards only increasing her speed. Beau launched from the shelter of the wall across the ice, his crampons biting the glassy surface. He reached her and his arm lifted her by her pack. They then moved together towards the wall. We were all picking ourselves up in the chaos. Paul had fallen as well, his legs fatigued and unstable. As Beau was returning to help him, Kyle appeared out of my peripheral vision seemingly disoriented. His upper body was curled and he had his hands up to his face. It was his goggles, they had frozen over and he could not see out of them. Tossed in the currents of air, he stumbled but was able to make his way to the wall where Adam was already taking shelter. Using my poles for stability, I waded through the river of wind towards the group. We were all safe now and Kellie used this moment to shake off the experience. She had climbed the mountain before, but not in conditions anywhere near as hazardous as this, and was now basking in the exceptional moment of safety in such a brutal place. For me this wasn’t the summit, however. There remained a pile of rocks just beyond the safety of the wall where a wooden sign protruded, evading destruction. It was the official summit and it was my goal to reach it. At this point my adrenaline was pumping as I had achieved something that, for the past two hours, I had spent convincing myself was impossible; the longest two hours at my most vulnerable. I would not deny myself this. I stood up wide-eyed and walked towards the edge of the wall, watching as particles flew by so fast, they left streaks in broad daylight. I stepped out into the powerful current and let it engulf me. The sound of rushing air past my head was deafening and my eyes fought to slam shut. I watched as full clouds were decimated over the surface of the summit, ripped to shreds over various features protruding here and there. Just behind me, Beau and Adam fell in line and we moved towards the rocky pile, leaving the rest at the wall. It was not far, but the sign seemed to point directly into the epicenter of the wind. It was a surreal experience standing there and at that moment I almost wished there was further for us to go, drunk with excitement and stimulation. It was something I dreamed of witnessing and I wanted it to last. From that moment on, the wind would be at our backs. We gathered at the wall and without even a gesture, began our descent. I followed, coming to the edge just before the trail turned down again. The adrenaline still buzzing in the back of my head, I looked out over the surreal landscape. Clouds erupted from behind me as the sun glistened off the polished ice. Small figures, my companions, were picking their way down and around scattered obstacles. This was a moment of conquest and I wanted to cherish it. I would periodically stop on the way down to admire where we all had been and the remainder of the hike felt like a pleasant victory lap. 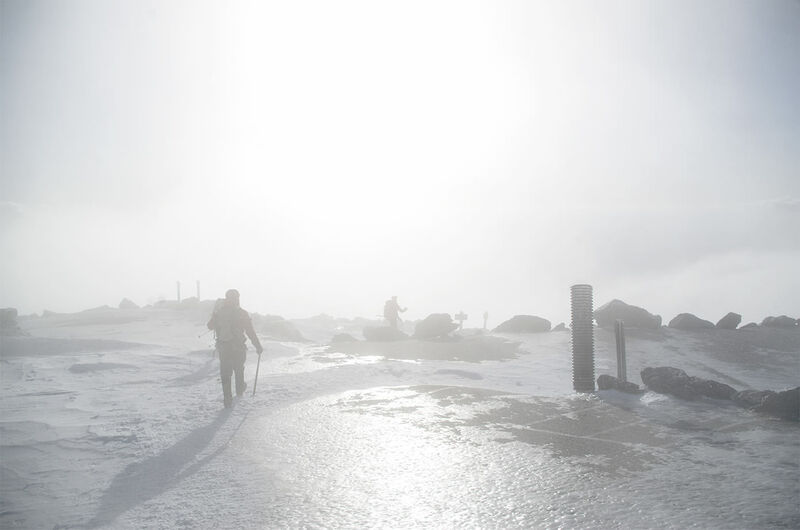 Cheery attitudes thawed and burst through in smiles and jokes, and even the mountain released the blanket of cloud into stunningly blue skies and bright sun. When I was on the mountain in the wind and cold, blinded and fatigued, I wondered why I do things like this. Reliving the events from the comfort of my home, I realize that I knew the answer in that moment too — it’s why I paused to take it in.